Kuwaiti authorities Thursday expelled several Iranian diplomats at the Islamic Republic’s mission in Kuwait after local authorities linked Teheran to a terror and spy cell. Iranian official source, ISNA news agency, reported that Ambassador Alireza Enayati has been asked to leave. The agency noted that only four of the some twenty diplomats working at the mission have been allowed to stay and the rest was given 48 days to leave. Kuwait also ordered closure of Iranian “military, cultural and trade” missions, reports say. A court sentenced last month members of a cell allegedly linked to Tehran and Lebanon-based Hezbollah. The leader of the cell was handed life in prison sentence while 20 others received various prison terms. The Thursday move was unprecedented. 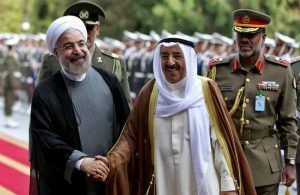 Kuwait has maintained good ties with Iran despite pressure from regional power Saudi Arabia to cut ties with Tehran. Last year, when Riyadh severed ties with Tehran, Kuwait city maintained diplomatic relations with Iran but only at the level of a chargé d’affaires. Iran rejected the accusations as baseless and communicated its strong objection to Kuwait’s chargé d’affaires. Iran reserves the right to a reciprocal measure, said the foreign ministry spokesman Bahram Ghasemi in a statement on his Telegram channel. “It is regrettable that Kuwaiti officials, in this sensitive situation in the region, instead of making an effort to reduce useless tensions… have targeted the Islamic republic with baseless accusations,” an Iranian foreign ministry official told the Kuwaiti Chargé d’affaires during their meeting, according to Ghasemi. Saudi Arabia welcomed the Kuwaiti decision to expel the Iranian diplomats. Written by: KanelkaTagba on July 21, 2017. Posted by KanelkaTagba on Jul 21 2017. Filed under Gulf News, Headlines. You can follow any responses to this entry through the RSS 2.0. Both comments and pings are currently closed.